Step up to a Beautyrest pocketed coil for conforming back support and motion separation for undisturbed sleep. The industry’s first hybrid mattress was a Beautyrest® innovation back in 2008, and the company keeps improving it. So what makes a hybrid a hybrid? It’s a mattress that combines the best of two worlds: the incredible support you get from traditional innerspring coils, along with the incomparable comfort of premium memory foam. The result? That’s easy. Best sleep ever. Beautysleep is real sleep at an economical price. Soft, high-quality AirFeel™ Foam assists with airflow and lends durability to the mattress. A foam-encased edge support system helps provide a supportive seating edge while maximizing your sleeping surface area. irCool® Memory Foam provides pressure relief and promotes freedom of movement. 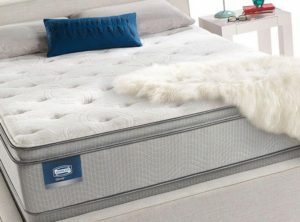 (select models) Exclusive wrapped coils at the heart of the mattress that adjust independently to the weight and contour of your body, providing long-lasting support and enhanced motion separation. GelTouch® foam is a soft, luxurious gel foam that provides soothing comfort like no other. SurfaceCool® is a fiber just beneath the fabric that’s designed to move heat away from the surface of the mattress to help maintain an ideal sleeping temperature.